I always wanted to be a singer, and so, when I was 5 years old, I started acting classes so I could be a better performer. I wanted to have a powerful voice so I could be heard. The things I do, I do from the heart and out of love and respect for our planet and all living things. And I draw my courage from my love for justice and truth, and I calm my fears by comforting those who are more scared than me. And I try to do my best to make the world a better place, one small action at a time, as good as I can. I used to have all these plans and think 'Ah, I have my whole life figured out', but then I realized no matter how much I plan: life happens! So I find myself living day to day trying to do my best, embracing every moment as a learning opportunity and chance to get to know myself a little more. Yes, I'm proud to be indigenous. 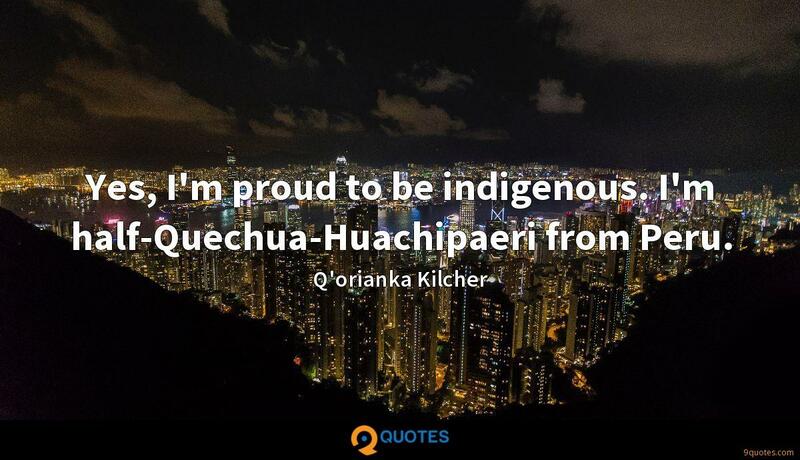 I'm half-Quechua-Huachipaeri from Peru. In Peru, if you gave somebody a little chance to do something, they took it to the furthest extent. They took nothing for granted. And here in L.A., you kind of get caught up in your own little dilemmas and your own little life. I just want to learn even more about my culture and about the Algonquin culture because I fell in love with Pocahontas and the Algonquin tribe. I prefer home-schooling because you can work at your own pace and go towards more what you're interested in, whether it be history or geography or math. I love the power of celebrity because you can give voice to the voiceless. 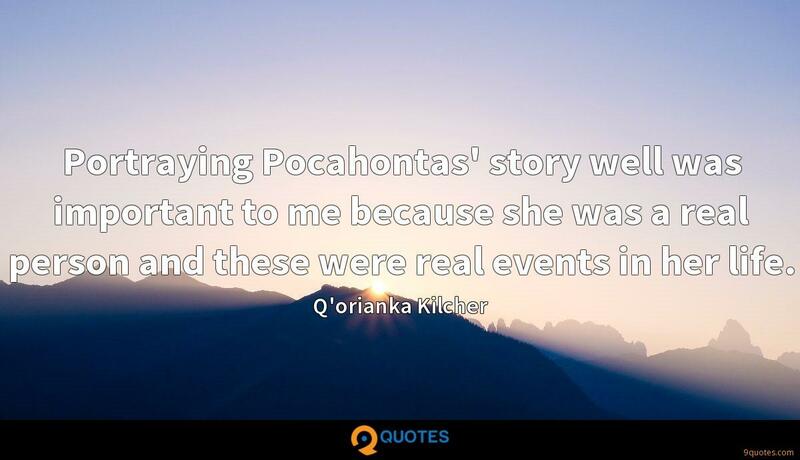 Portraying Pocahontas' story well was important to me because she was a real person and these were real events in her life. If Pocahontas had been given the foresight to see what devastating consequences her actions and belief in the possibility of peace would have brought upon her people, I wonder if she would have avoided befriending the English or not. I really identified with Pocahontas' struggles as a young woman trying to identify herself in a modern, changing world and trying to stay true to her culture and heritage. Here in L.A., you kind of get stuck in your own little dilemmas and your own little life, and hearing a story like Pocahontas' reminds you there's a bigger world out there, and there are so many more important things in life. My father's Peruvian! I actually have a lot of family in Cuzco. I'm also Swiss, Alaskan, French, Spanish and Italian. 'Firelight' is a beautiful story about a lot of young women. My character, Caroline, is a girl who has a bad boyfriend, and he ends up getting her locked up and incarcerated. I think it's important for us as a society to remember that the youth within juvenile justice systems are, most of the time, youths who simply haven't had the right mentors and supporters around them - because of circumstances beyond their control. Instead of locking people up and throwing away the key, it's important to invest in them and show them another way - show them what they can do, instead of telling them what they can't do. Because by investing in youth, we're investing into the future of this great nation of the United States of America. My birthday is Feb. 11, and I'm both excited and not excited by it. You'll never be 15 again, and you really, really need to savor every day like it's your last. I know that might sound silly coming from someone my age, but I remember on my 14th birthday having a crisis like my mom should be having. I kept thinking that I was getting older, and I haven't really accomplished anything. I remember thinking that I better accomplish something real soon. You need people around you that care about you and are thinking about you in your best interest. And keep your mind straight. I honestly think I was an Indian living in the time of the Trail of Tears. Something like that. Every time I read books about back then, I get so devastatingly sad, so, so... I feel such a deep connection to it. I lose film roles because I'm a person who doesn't keep quiet about certain things. But if my heart tells me something is wrong, I'm going to go and do something about it. Films are very influential, and I especially feel a responsibility to tell stories that have been pushed aside. Being able to shed light on issues that need to be brought to the world. I feel like, as a celebrity, I have a responsibility to tell important stories. I grew up doing a lot of traveling. My mom left home when she was 15 and traveled to 48 different countries and speaks six different languages. So I grew up with my eyes open. She raised me so that if my heart says something is wrong, I have to go help. What's right is right and what's wrong is wrong.